Kirkwood’s is the only Mid-Rise, Covered Deck Parking, Multifamily Rental Product within Historic Kirkwood. Lying to the East of Atlanta, Kirkwood is a Nationally Designated Historic Neighborhood with Nearly 2,000 Contributing Resources. The Kirkwood Historic District is the Largest Historic District in the State of Georgia. Downtown Kirkwood is within Walking Distance of The Kirkwood, Offering Wonderful Dinning Options as well as a Great Cup of Coffee. Not only will you Fall in Love with The Kirkwood, your Furry Family Members will as well! We have very Close Proximity to Georgia State as well as Georgia Tech, Georgia Aquarium, Atlanta Zoo and so much more. This is what makes The Kirkwood a Wonderful Choice for your New Home! 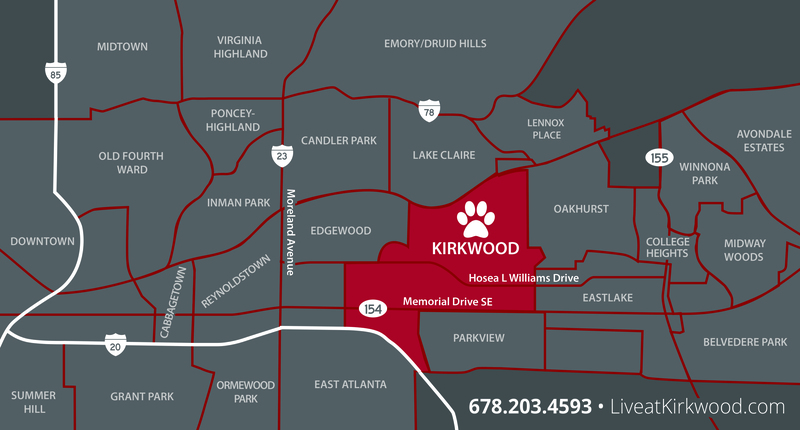 With Convenient access to I-20, I-285, I-85 and I-75, The Kirkwood Apartments is Perfect for Commuting or Exploring the Town. Schedule a Tour Today of our Luxury Apartments and Picture yourself in your New Home at The Kirkwood.